The Champ de Mars track follows a very selective right hand oval path . Being 1298 m in circumference and 12 to 14 metres wide, it is relatively small in size and very competitive. The home-straight extends uphill and is 250m long. 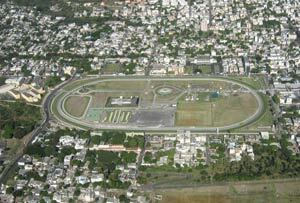 Three shoots were added to the initial circular path to allow an even start for fields in 1000 m, 1600 m, 1850 m races. Races are run on usual distances from 990m to 2400m, including distances to mark historic events or key figures like the 1365m, situated in front of the mast where is raised the flag in commemoration of the Independence Day, and the Draper's Mile (1500m), named after the founder of the club.